We have a new dog his name is Rocky. Rocky was taken out of the pound where he was turned in by his owner who no longer wanted him. Rocky is sad, he had lived with his family since he was born. 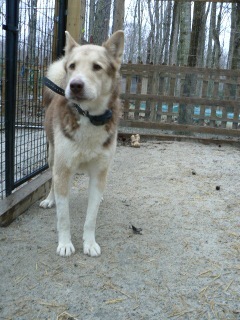 Rocky is a chocolate husky mix, a neutered male, house broken,up to date on shots, heart worm free and good with children. Rocky needs a loving home where he’ll feel wanted.